Itinerary duration: 8 days / 7 nights. 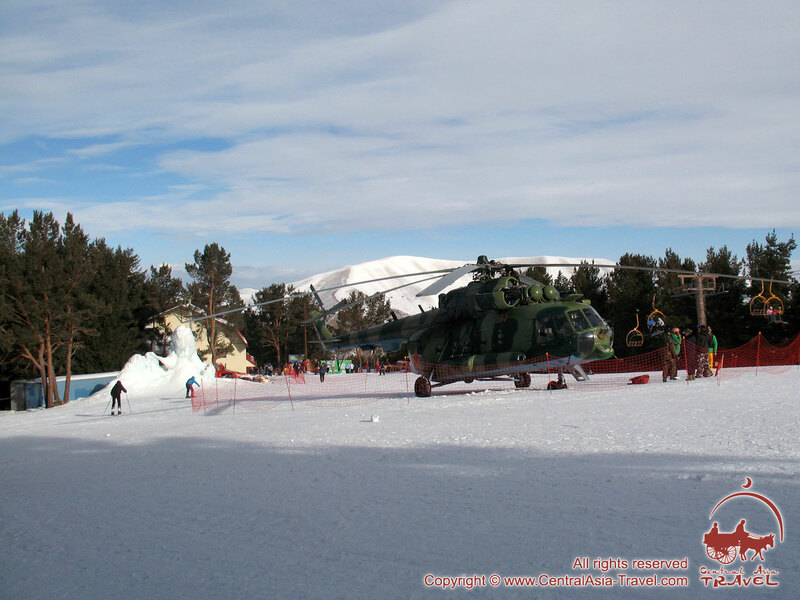 Suusamyr: Bishkek - ‘Too Ashuu’ ski base - heliskiing program - Bishkek. 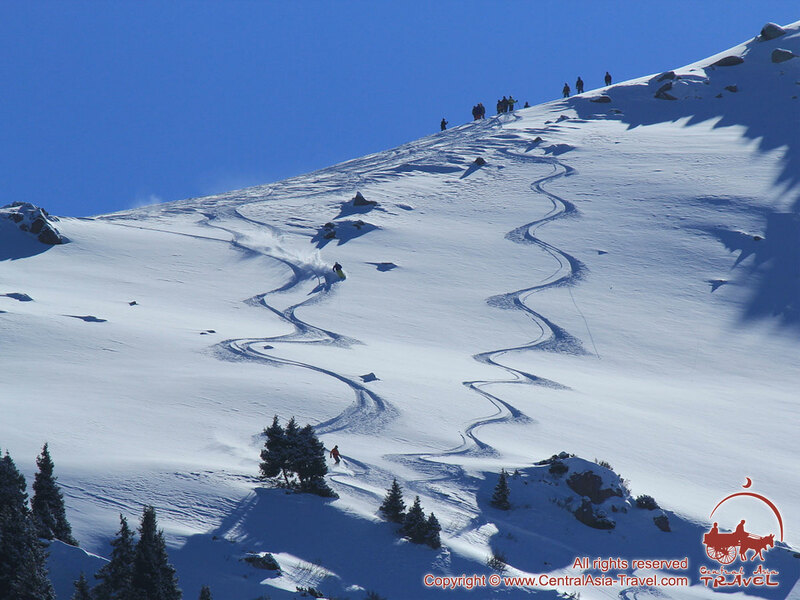 The heliskiing programs in Kyrgyzstan are opened on 14 January 2017! 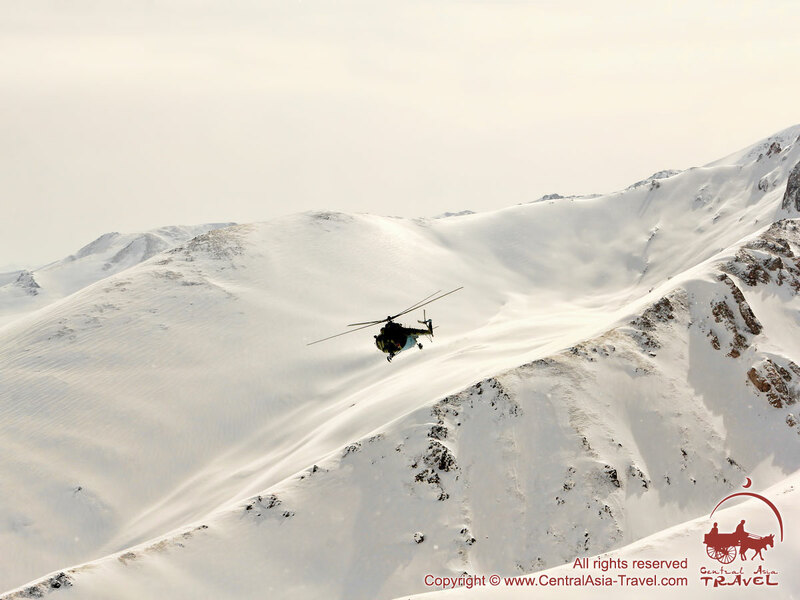 You will be taken by a helicopter to the pristine snow-covered slopes of the Tien Shan Mountains, far from official ski tracks, from where you will have a breathtaking downhill! The helicopter will allow us to quickly find a good downhill track in the very heart of the primeval nature, which is impossible using any other means. With over 65 % of its territory occupied by high mountains, Kyrgyzstan has plenty of area suitable for heliskiing (heli-skiing) or heliboarding. There everyone can find a slope that would suit them perfectly in height, length and gradient. 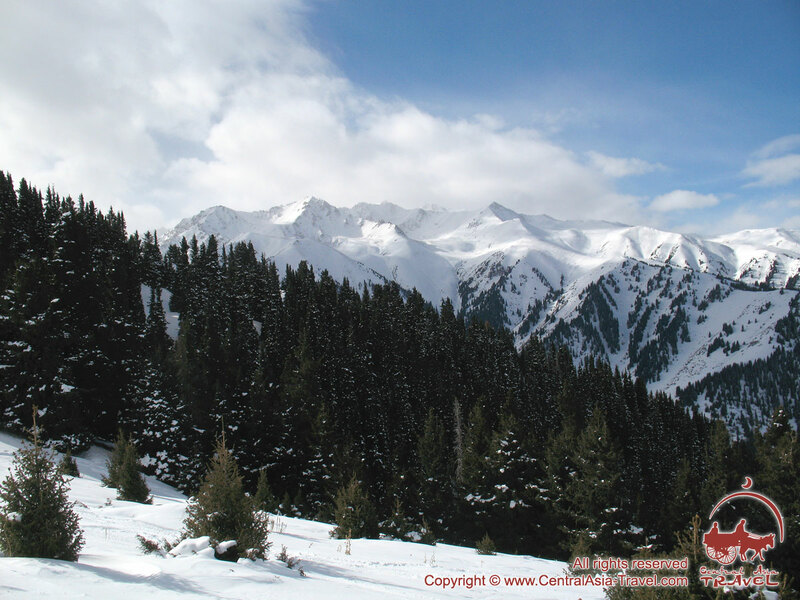 The average height of the Kyrgyzstan mountain ranges is 4,500 m above sea level. 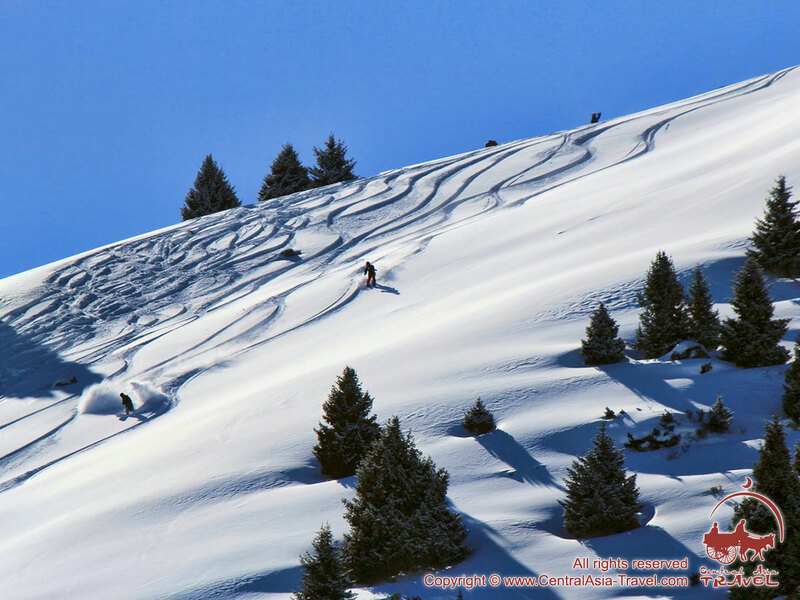 Many of the slopes are decorated with century-old spruces (Picea schrenkiana ssp. tianschanica). 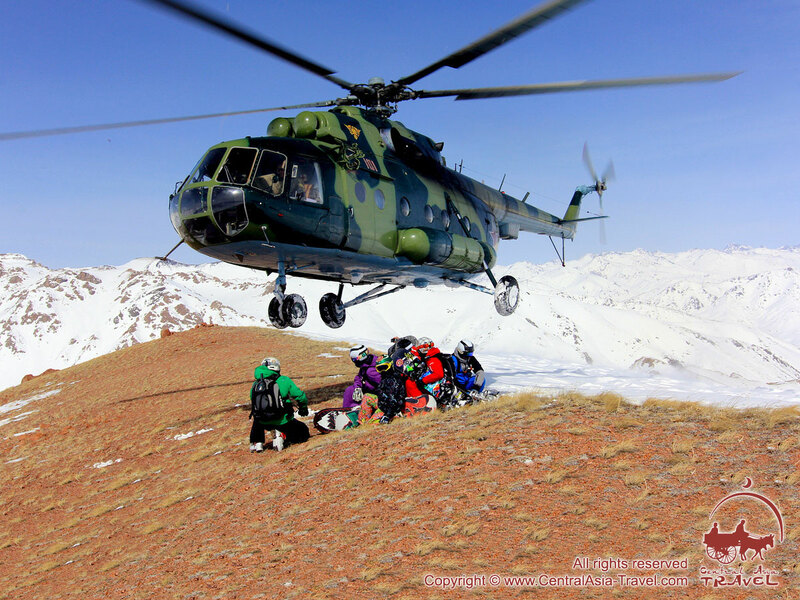 Given below are the 2 most popular heliskiing programs in Kyrgyzstan: heliskiing near Lake Issyk Kul (accommodation in ski camp ‘Karakol’, 430 from Bishkek) and heliskiing in the Suusamyr valley (accommodation in ski camp ‘Too Ashuu’,130 from Bishkek). 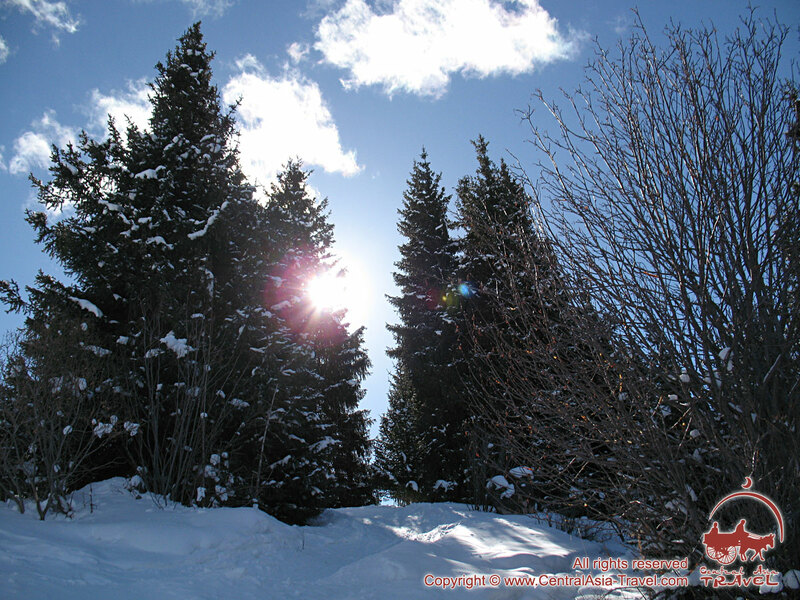 Fantastic virgin mountain landscapes, dry fluffy snow, a blue sky and bright southern sun - what can be more attractive for true lovers of downhill skiing and snowboarding! The heliskiing (heli ski) event will take place at Lake Issyk Kul, the second largest mountain lake in the world after Lake Titicaca in Peru. Lake Issyk Kul is situated in the Tien Shan Mountains (Tian Shan Mountains) at 1,610 m above sea level, inside a ring of picturesque mountain ranges capped with never melting snow, which, however, do not prevent the lake from remaining ice-free throughout the year. 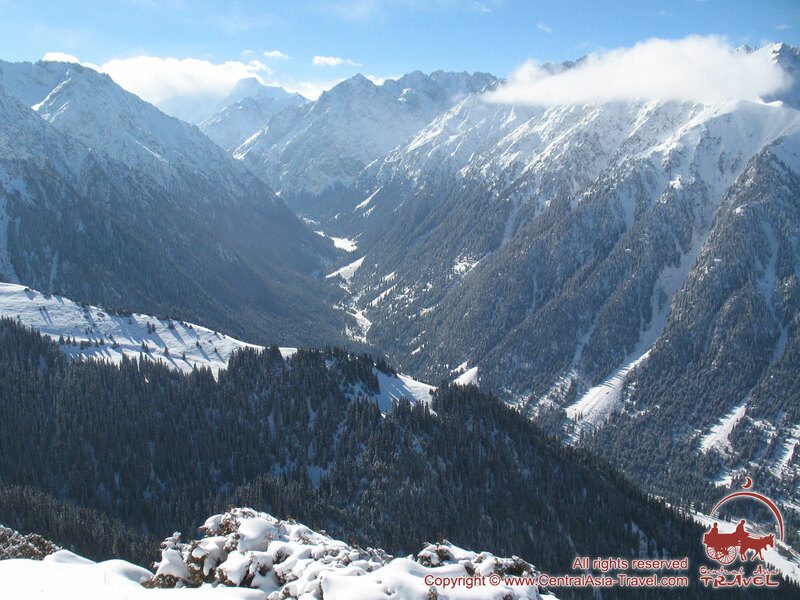 From the south Lake Issyk Kul is walled by the powerful Terskey-Alatoo Range, rising to a height of 4,500 m throughout, Karakol Peak (5,281 m) being its highest point. 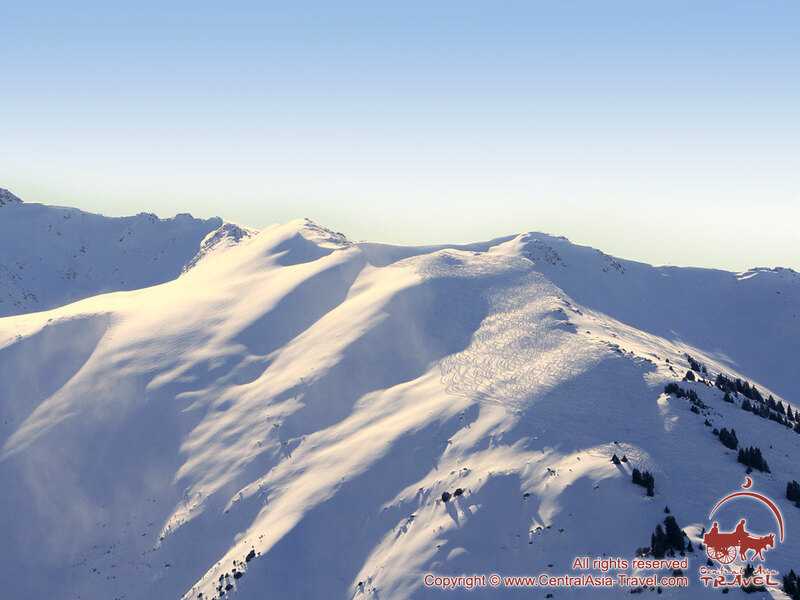 The range features a great number of very good slopes at elevations from 2,000 m to 4,500 m, which provide plenty of opportunity to heliski on the purest snow among century-old spruces. Every summit or pass your group will be brought to in a helicopter will give you a wonderful view of the peaks of the Terskey-Alatoo Range (Karakol, Jigit and Oguz Bashi Peaks among others), on one side, and the largest ultramarine mirror of Lake Issyk Kul, on the other side. 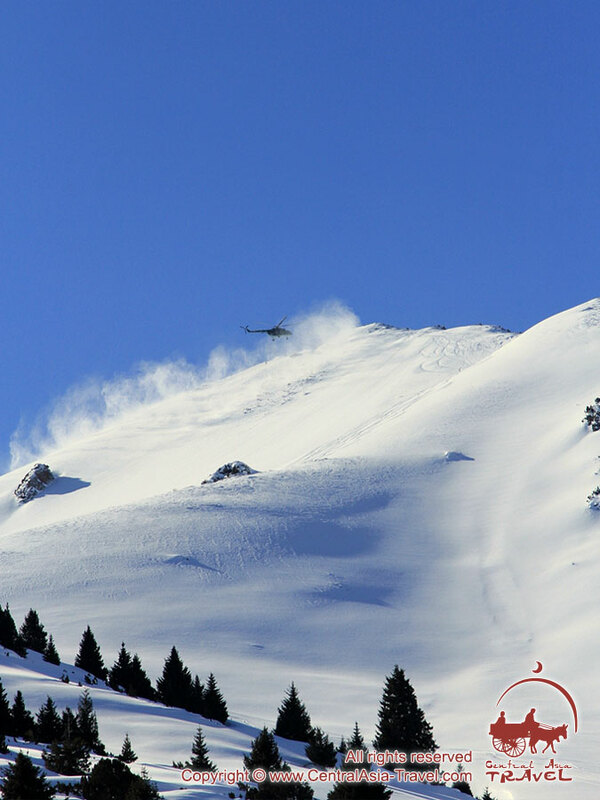 • The tour price includes a total of 9+4 hours of use of a helicopter (9 hours for bringing the skiers onto a slope and 4 hours for transfer from Bishkek to Karakol and back), 5 to 7 downhills a day, accommodation at ski resort ‘Karakol’, three meals a day and various transfers. • The ski resort ‘Karakol’ (mountain base) is situated 7 km from the town of Karakol, at an elevation of 2,300 m, amidst the majestic coniferous forests of the Tien Shan Mountains. • The helipad is located 100 m from the hotel. • The flying time from the hotel to the ski areas from 5 to 20 minutes. • The climate of the area is mild, which is conditioned by the warm water of Lake Issyk Kul. 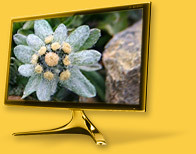 • The winter is warm, with an average winter temperature of -5°C. • The snow cover may reach 1.5-2 m in thickness. • The skiing season lasts from November till May. Enormous glaciers and fantastic mountain landscapes, a blue sky and a bright southern sun, the pristine areas of a snowy realm and hot springs - is there anything more attractive for a true lover of heliskiing and heliboarding! Day 1. Arrival in Bishkek. 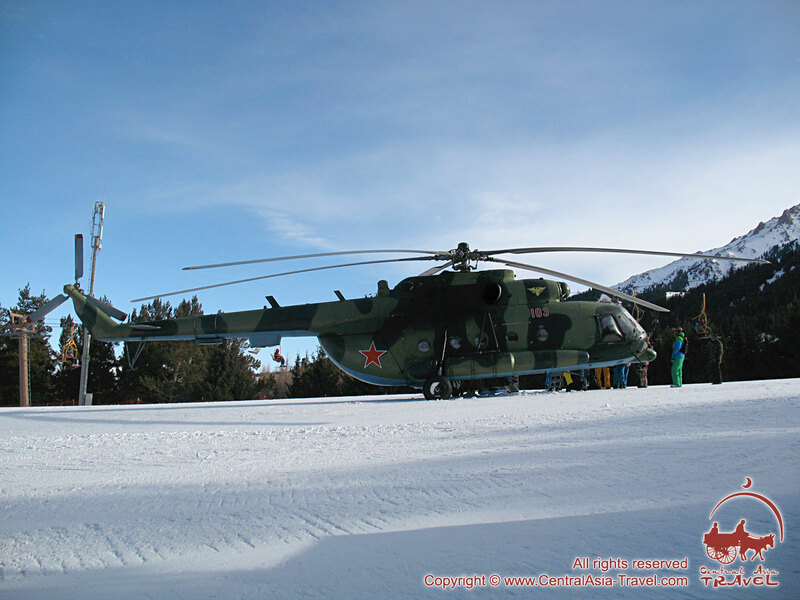 Transfer to ski resort ‘Karakol’ (Mountain base). Arrival in Bishkek. Meeting at the airport ‘Manas”. Transfer to Bishkek. Breakfast. Transfer to the town of Karakol in a comfortable bus (400 km). The road leads through the Boom Canyon, along the shore of Lake Issyk Kul*. Accomodation at ski resort (mountain base) "Karakol (Kashka-Suu)". Lunch. Safety instructions with a possible visit of the heliskiing tracks. Rest and acclimatization. Supper. Days 2-6. 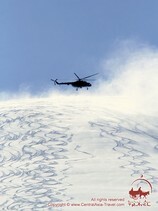 The heliskiing program. - 09:00. 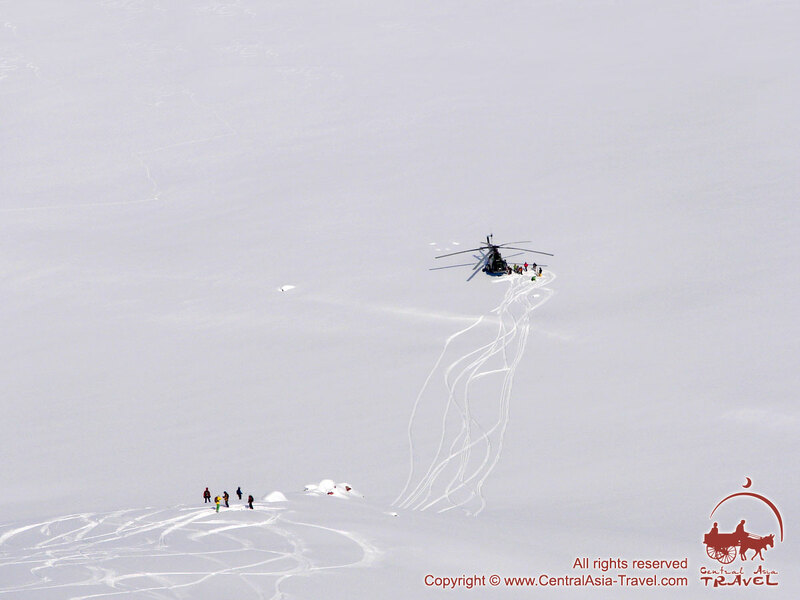 Transfer to Heliski areas. - 12:00. Lunch in the mountains. - 15:00. Return to hotel. Day 7. Transfer to airport ‘Manas’ (Bishkek). - 15:00. Return to the hotel. * The type of transfer from Bishkek to Karakol and back will depend on weather conditions: if they are good, you will have a two-hour flight in a helicopter; if they are not good for flying, you will be brought to the place in a comfortable bus (400 km, 6-7 hours). 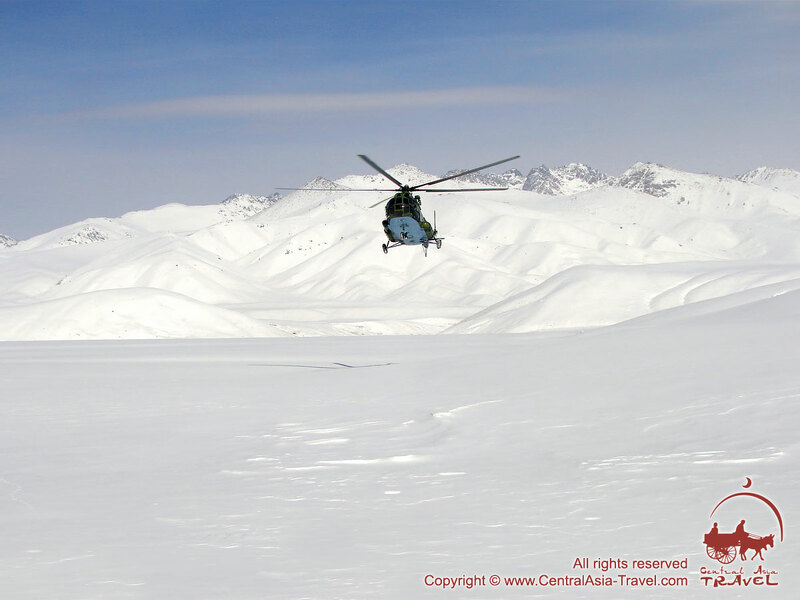 • 13 hours of helicopter time: 9 hours for riding and 4 hours for transfer from Bishkek to Karakol and back. 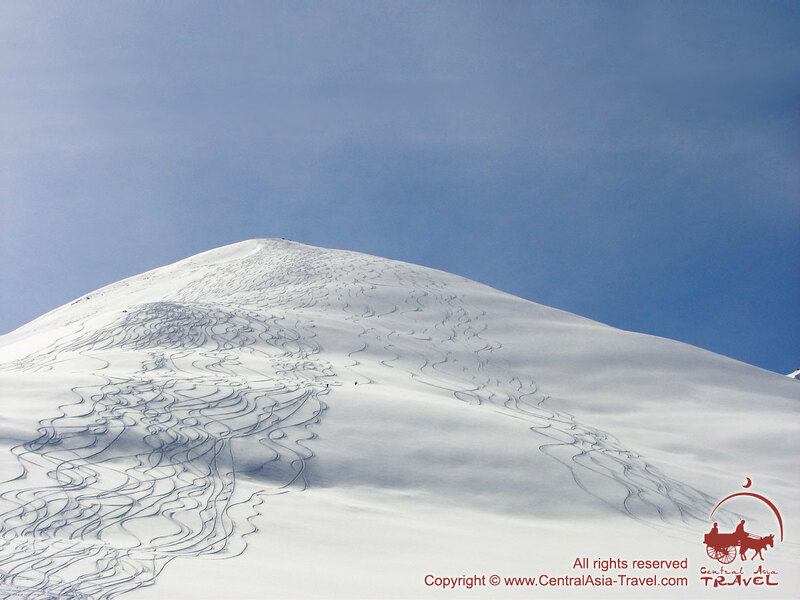 • Accommodation in standard double rooms at ski resort (mountain base) ‘Karakol’ - 7 nights. • All group transfers mentioned in the program (Bishkek airport - "Kashka-Suu (Karakol)" mountain base; "Kashka-Suu (Karakol)" mountain base - Bishkek airport). • Meals: three meals a day at the ski camp; breakfast and lunch on ‘flying’ days at Kapriz Karakol Hotel. • Service of professional HeliPro guides. • Avalanche and rescue equipment: ABS backpack, sensor (transceiver), shovel, probe. • Sauna (2 hours per day, sauna's capacity is 10-12 persons). • Skiing in a Ski resort ($15 per person per day). • Riding on snowmobiles Yamaha ($100 per hour). • A bar, disco, billiard, karaoke. 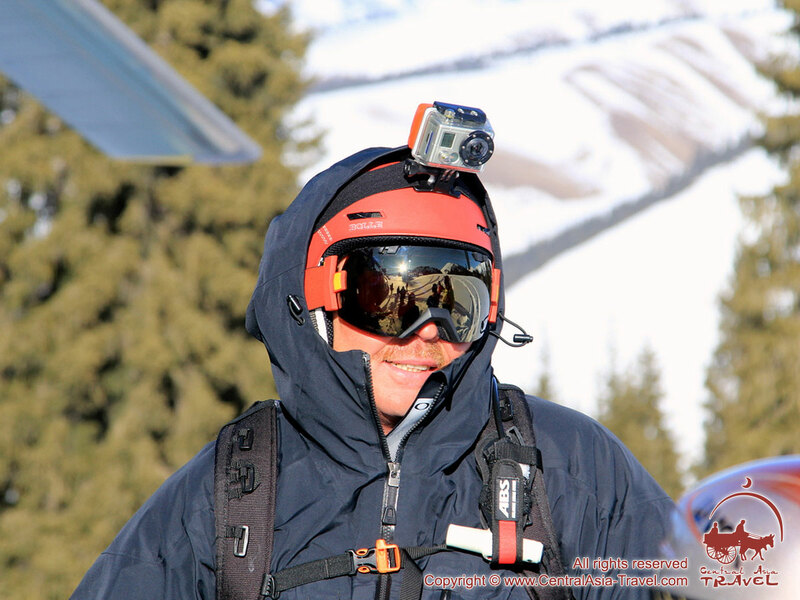 • Ski, snowboard and other equipment rental fee. • Evacuation in case of emergency. 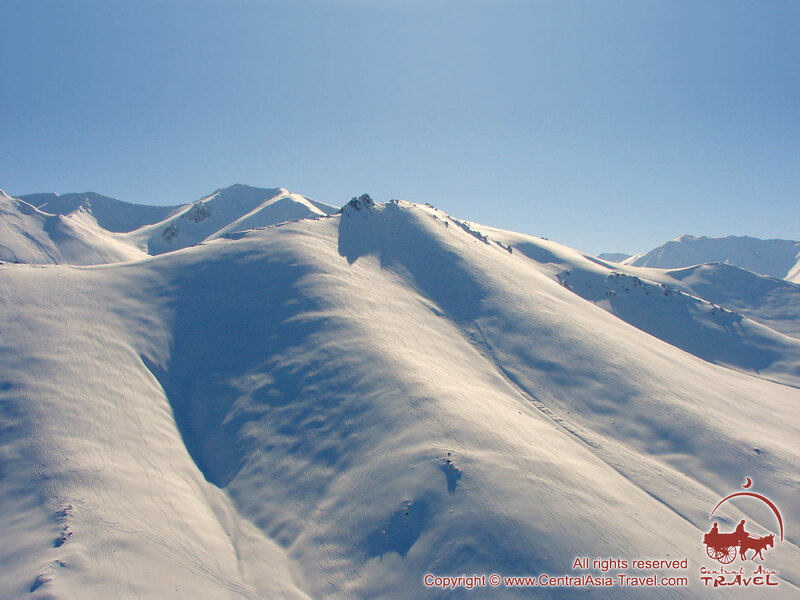 • Additional cost for single accommodation in "Kashka-Suu (Karakol)" mountain base. • Visa and other consular service (Kyrgyzstan visa is required for the foreign visitors, not for Russians). • Individual expenses in the hotel: bar, international calls etc. • Individual menu (drinks and meals not included to the group menu). • Additional expenses caused by bad weather, changes in the air flight schedule, breakdown of the equipment, illnesses or other unforeseen circumstances. 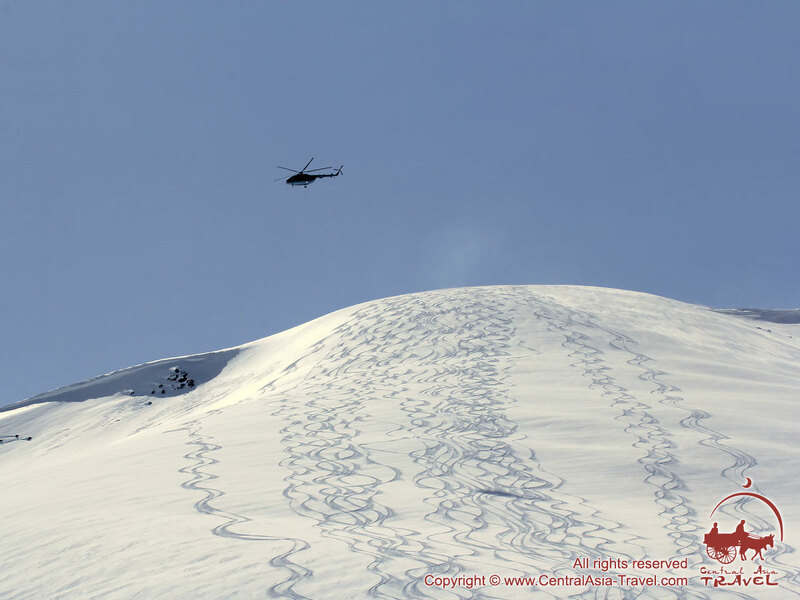 • Additional heliskiing is available at +$260/1 hour of use of the helicopter. • In case the program was not completed due to weather conditions or because it was not safe to go heliskiing, the clients are given back their money for the ‘unused’ hours. • You are required to have insurance. 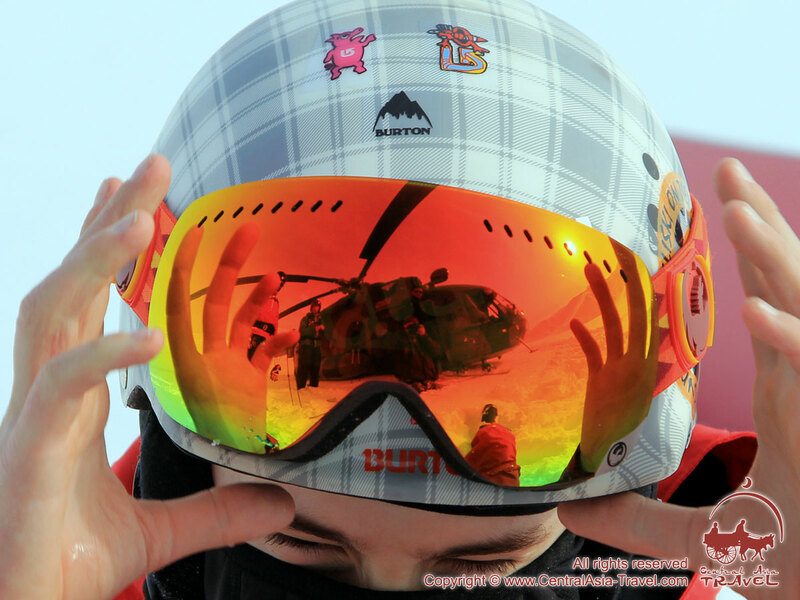 Persons having no insurance policy (flying in a helicopter and skiing/snowboarding are regarded as contingency) for a minimal sum of $10,000 cannot be permitted to participate in the program. A participant without the policy will not be allowed inside the helicopter and will not be given back their money. Refund for every “unused” helicopter hour - $180. Address: Ski Resort ‘Karakol’, Issyk Kul Province, Kyrgyzstan. 7km from Karakol, 430km from the capital Bishkek, 460 km from ‘Manas’ airport. The ski resort (ski base, mountain base) ‘Karakol’ is located on the slopes of the Tien Shan Mountains, amidst majestic coniferous forests, at an altitude of 2,300 m above sea level. The resort functions all year round. The mild climate of the place conditioned by the close location of Lake Issik Kul will allow you to delight in downhill skiing and snowboarding. In winter the air temperature rarely drops below -5 degrees. 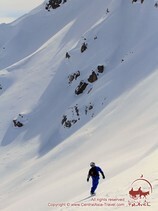 The skiing season lasts from November till April. The thickness of snow cover in this period ranges from 1.5 m to 2.5 m.
People are brought onto the mountain slopes using two chairlifts. Resort has more than 20 km of trails which can satisfy both professional rider and beginner. 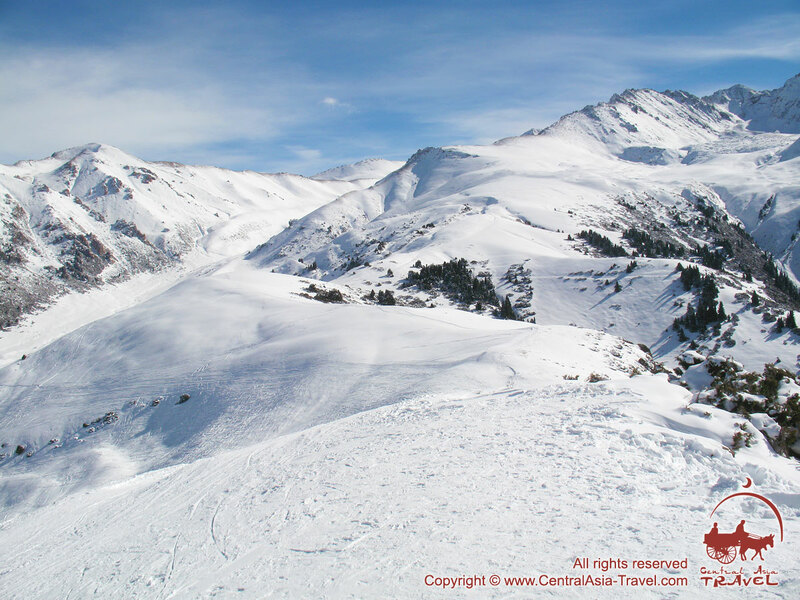 Ski area features wide spacious descents both on country side and specially prepared slopes. 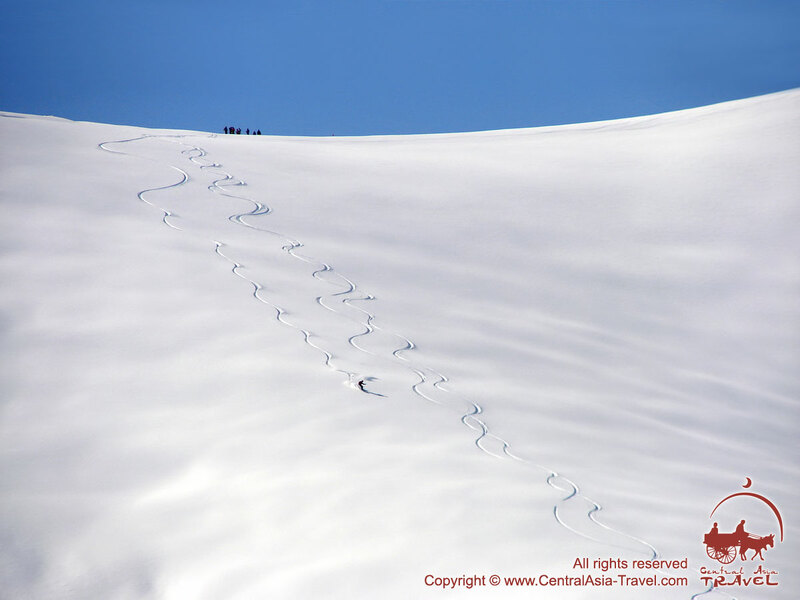 The length of descent can vary from 400 meters to 3,5 km; most trails lay over the coniferous forest. You can ski at different height. Toplift is located on 3040 m. Average vertical drop is 800 m; minimum down gradient 7%, maximum - 53%. 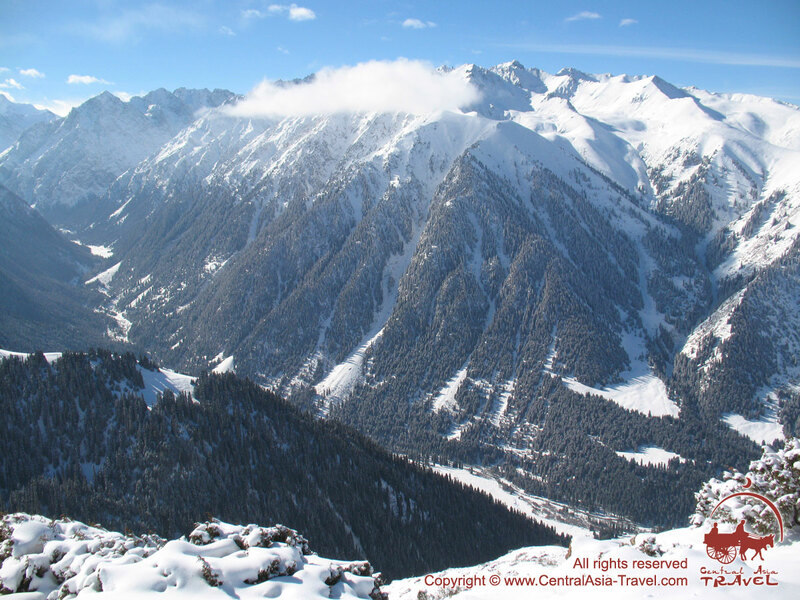 You can see nearest 5000 meters tall mountains and famous Issyk-Kul Lake from the top summit of the resort. 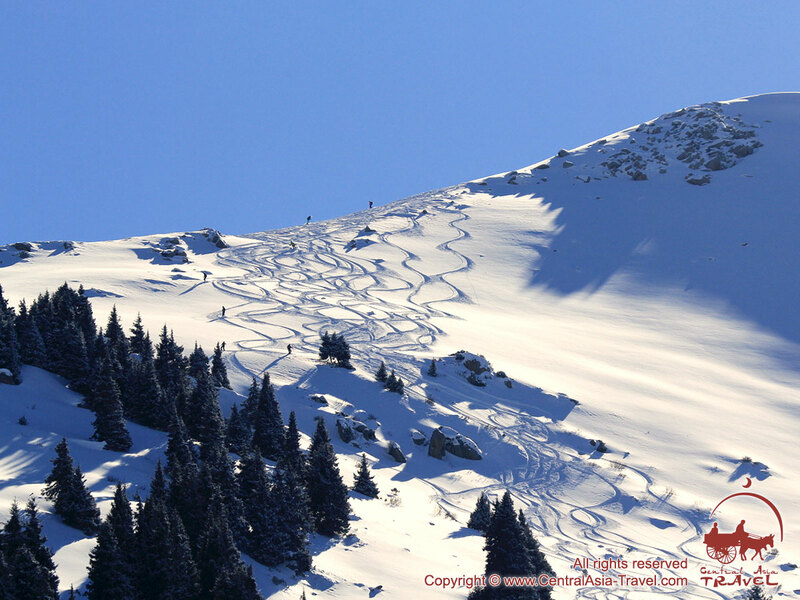 All the ski trails (ski runs, pistes) are prepared with the help of snow groomers. 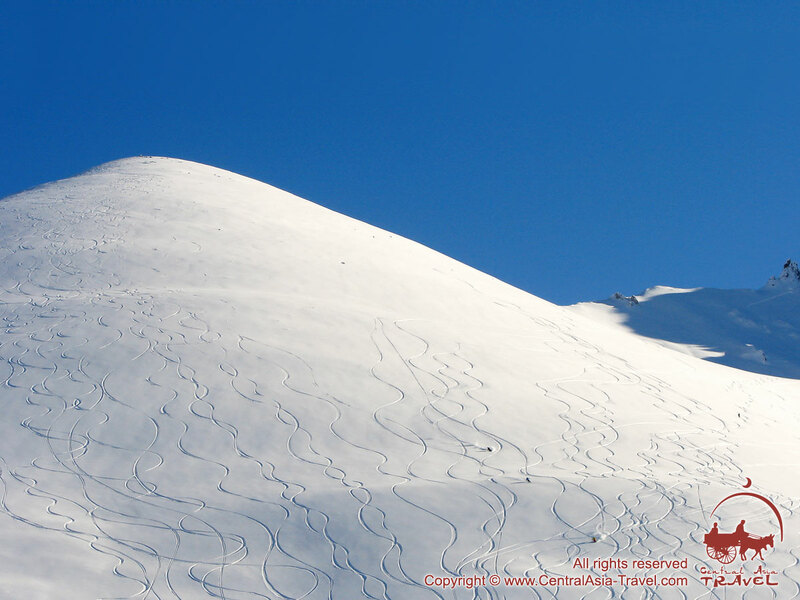 Those who are fond of riding on fluffy snow can be taken to the slopes on snowmobiles. Those who love backcountry (off-piste) skiing can ride in the forest or downhill on the pristine snow of the eastern slope. Additional service: if the weather is not good for skiing, you can have an excursion into the city of Karakol and visit the old wooden Dungan Mosque, a Russian Orthodox Church and a memorial to the famous traveller N. M. Przhevalsky. Next to the city is the Altyn-Arashan Gorge with a small resort with hot radon and hydrosulphuric springs. Bathing in them after an active riding you will feel absolutely recovered. 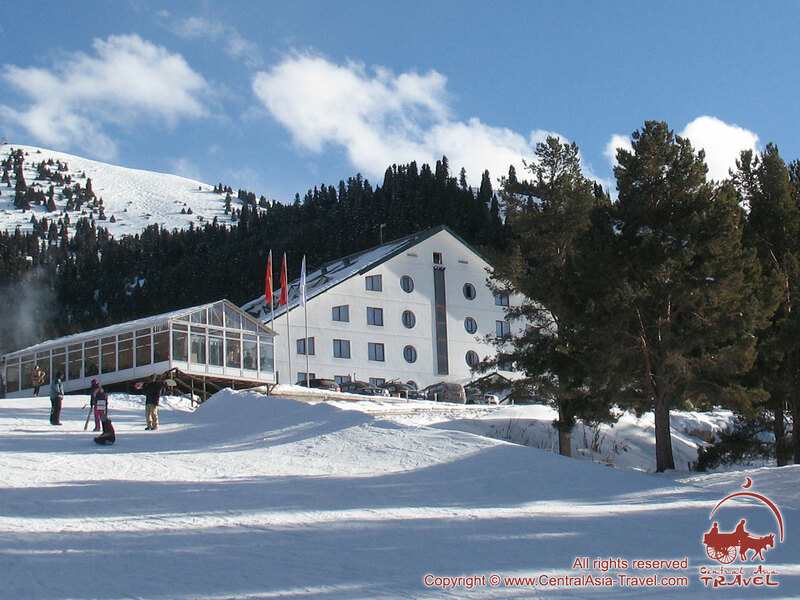 The ski resort ‘Karakol’ offers a hotel of three buildings and a number of cottages (chalets). All rooms have all necessary for comfortable accommodation, each room has private shower/wc. Deluxe rooms Deluxe rooms are suitable for people who like to recreate with top comfort. The cottage accommodates 11 persons and has all necessary furniture and a garage for 2 cars. In the hall: a billiard table, television sets, a refrigerator and a microwave oven. On the ground floor: 2 bedrooms (one with single beds and the other with a double one), 2 bathrooms with toilets. On the first floor: 3 bedrooms (with single and double beds), 2 bathrooms with toilets and shower cubicles (including one shower cubicle in one of the bedrooms). Three-storey chalet (red house) The cottage is situated in the forest and accommodates 8 persons. On the ground floor: a spacious hall with a fireplace, a bar, soft furniture, a large television set and a bathroom with a toilet. On the first floor: two two-room suites. One of the suites has a bathroom with a Jacuzzi, the other - a shower cubicle. One room in each suite contains a double bed; the other - soft furniture and a television set. On the second floor: two double rooms with two single beds in each, a television set and bathrooms with toilets and shower cubicles. Two-storey chalet (yellow house) This comfortable two-storeyed cottage accommodates 8 persons. On the ground floor: a common parlour, two bathrooms with toilets and shower cubicles, a bedroom with two single beds. On the first floor: three bedrooms with double beds. Two-storey chalet (blue house) A cosy two-storey cottage accommodating 8 persons. On the ground floor: a common parlour, two bathrooms with toilets and shower cubicles, a bedroom. On the first floor: three separate bedrooms with double beds. Single, double and triple hotel rooms Single rooms and two-room suites varying in the number and type of beds (single and double). Each single room and suite has all necessary furniture, a television set and a bathroom with a toilet and shower cubicle. Rooms Nos. 5 & 8 (building 3) are equipped with refrigerators. • An office for hiring skiing outfit and snowmobiles. The program venue is Suusamyr Valley situated between two mountain ranges, the Kyrgyz Alatoo in the north and Suusamyr-Too in the south, at an altitude of 2,200-2,600 m, 130 km from Bishkek. 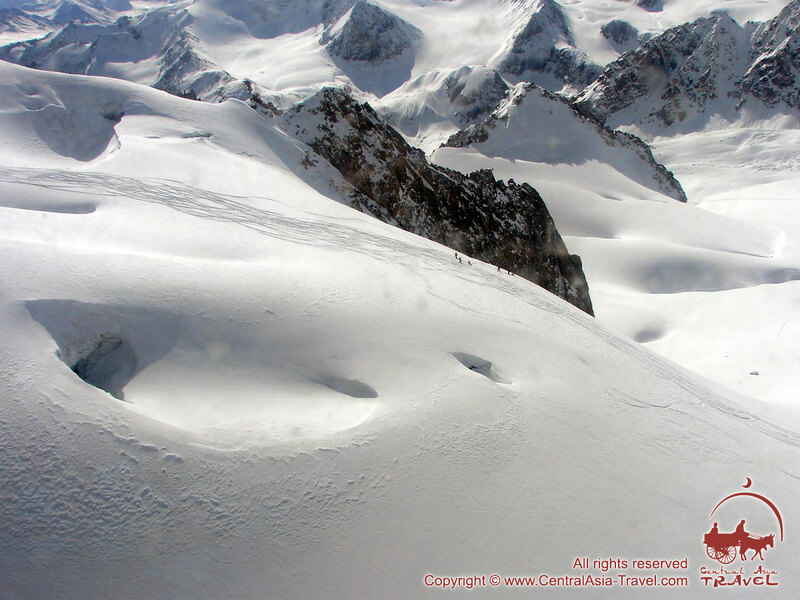 The valley is surrounded on all sides by numerous snow-capped summits up to 4,500 m in height. 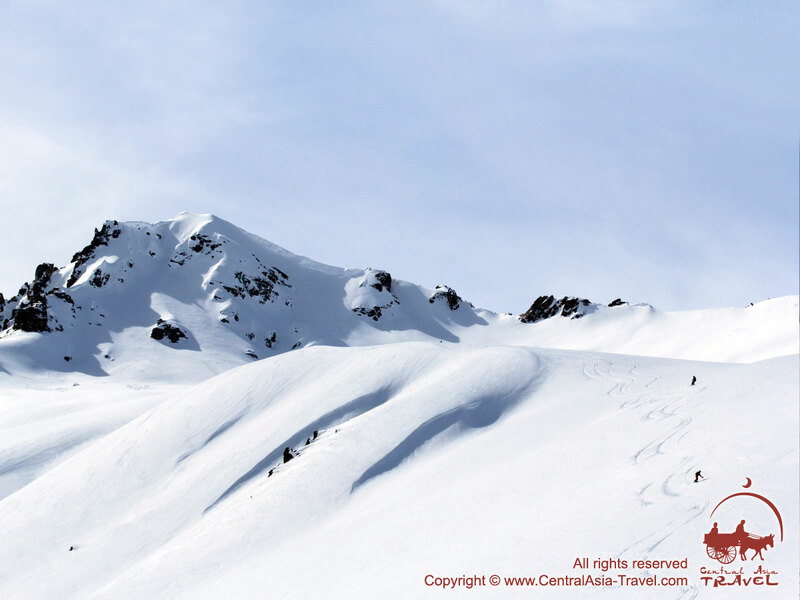 Skiers usually ski in the Ala-Archa, Alamedin, Noorus and Belogorka Gorges, as well as on the northern slopes and glaciers of the Kyrgyz Range. The area is unique thanks to a great choice of slopes with different exposition, extent and differentials. The Suusamyr Valley (100 km long and 5-20 km wide) is a kingdom of snow and silence, frequented by all kinds of skiers and snowboarders - from novices with beginner skills to highly experienced lovers of pristine snow and backcountry skiing (off-piste skiing). 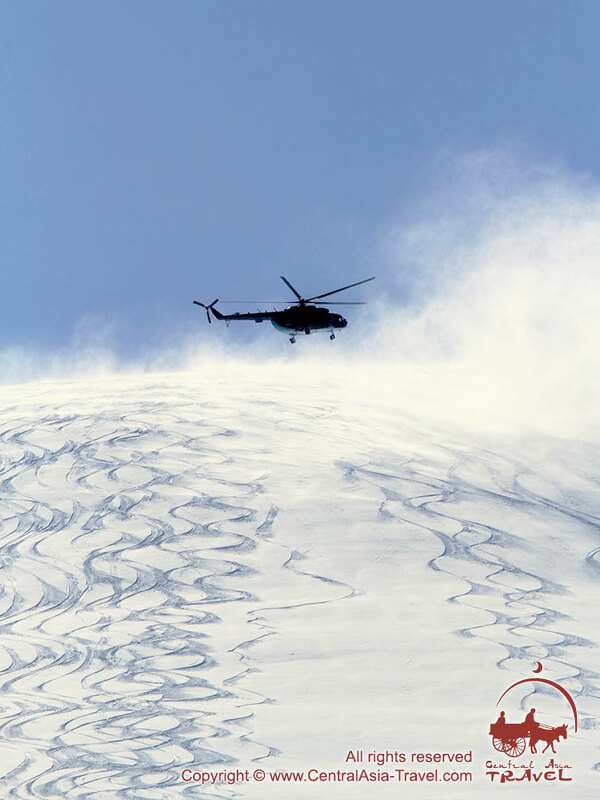 • The tour price includes a total of 8+1 hours of helicopter time, accommodation at ski base ‘Too Ashuu’, full board and all transfers, service of professional guides, life-saving and avalanche equipment. • Ski base ‘Too-Ashuu’ (ski resort) is situated 135 km from Bishkek at 3,000 m above sea level (the most high altitude ski base in Kyrgyzstan); the area features the longest ski trails (pistes, tracks, ski runs) in Kyrgyzstan - from 1,500 m to 5,000 m.
• Stable windless weather for most of the time. • Stable snow cover from early November till late March. • Most of the riding zones are within an easy approach and require short flying time to get to. • Great altitudinal differentials (up to 1,200 m). • The great numbers of descents from one place of landing. 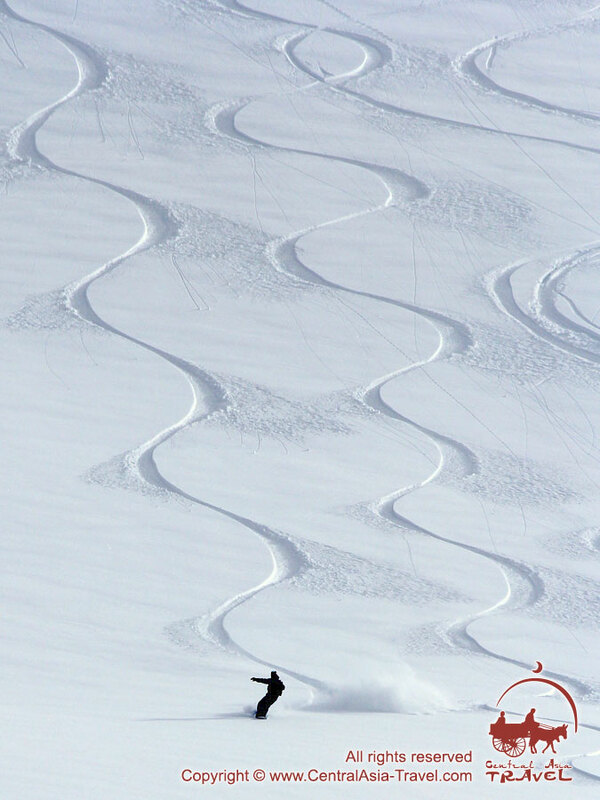 • A perfect quality of snow - cold winter powder with depth up to 2,5 metres! - Driving with use of SkiDoo and SnowCat (snowgroomer with a cabin for passengers). 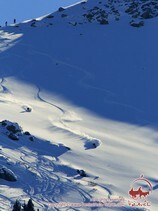 - Paragliding, speedriding, and riding a chairlift (a ski lift). Day 1. Arrival in Bishkek. Transfer to ski resort ‘Too Asuu’ (Mountain ski base). Arrival in Bishkek. Meeting at the airport ‘Manas”. 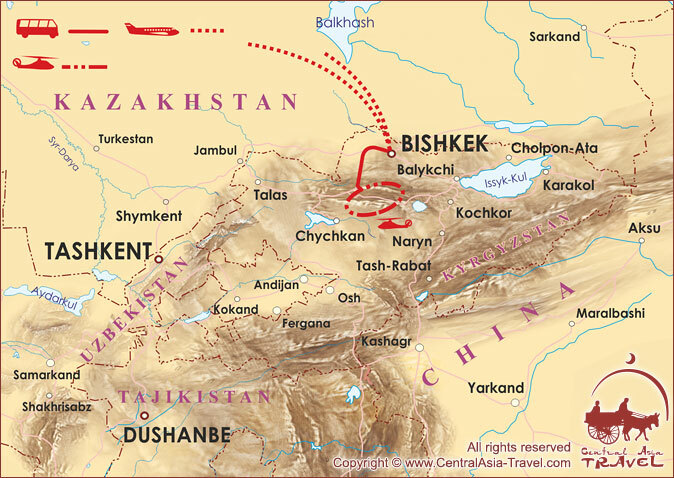 Transfer to Bishkek. Breakfast. Flight (transfer) to Suusamyr valley*. Accommodation in ski base "Too Ashuu". Lunch. Acquaintance with area, guides, instructing on safety techniques. Riding with use of helicopter if possible. Supper. - 09:00. Transfer to the riding area. - 13:00. Lunch in the mountains. - 17:00. Return to the base. - 16:00. Return to the base. 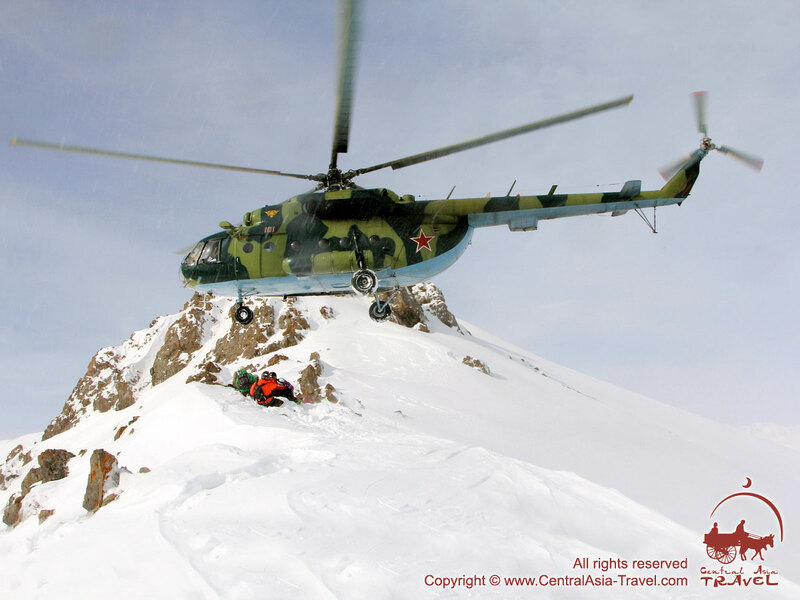 *The type of transfer from Bishkek to Suusamyr valley and back will depend on weather conditions: if they are good, you will have a helicopter flight; if they are not good for flying, you will be brought to the place in a comfortable bus. 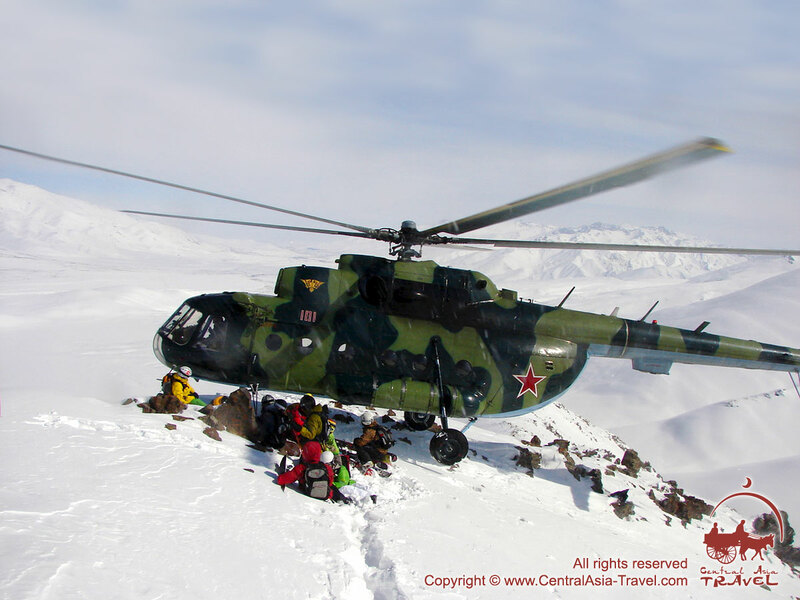 • 9 hours of helicopter time: 8 hours for riding and 1 hour for transfer from Bishkek to Suusamyr valley and back. 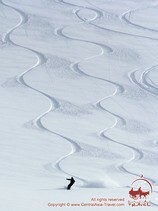 • Accommodation in standard double rooms at ski base ‘Too Ashuu’ - 7 nights. 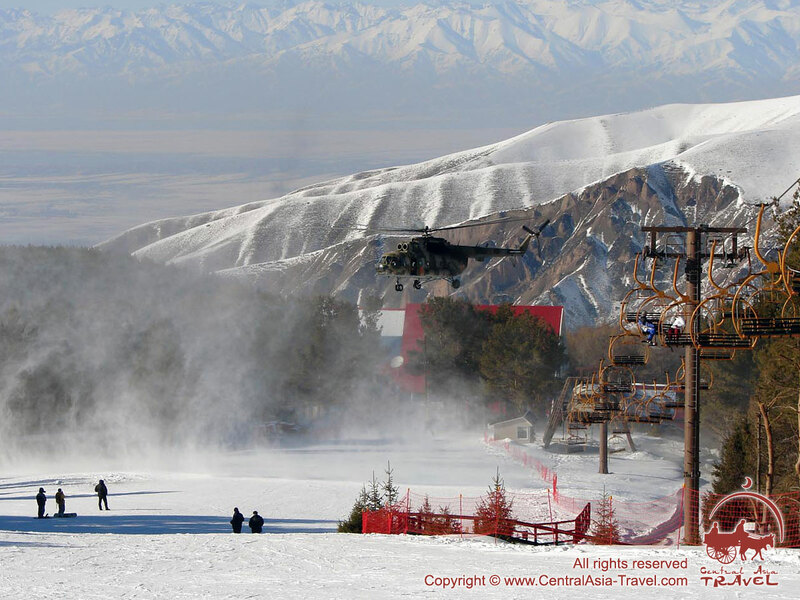 • All group transfers mentioned in the program (Bishkek airport - "Too Ashuu" ski base - Bishkek airport). • Riding on snowmobiles ($80 per hour). • Additional cost for single accommodation in "Too Ashuu" ski base. • In case the program was not completed due to weather conditions or because it was not safe to go heliskiing, the clients are given back their money for the ‘unused’ hours**. ** Refund for every “unused” helicopter hour - $180. Address: Ski Resort ‘Too Ashuu’, Kyrgyzstan. 135 km from Bishkek airport ‘Manas’. 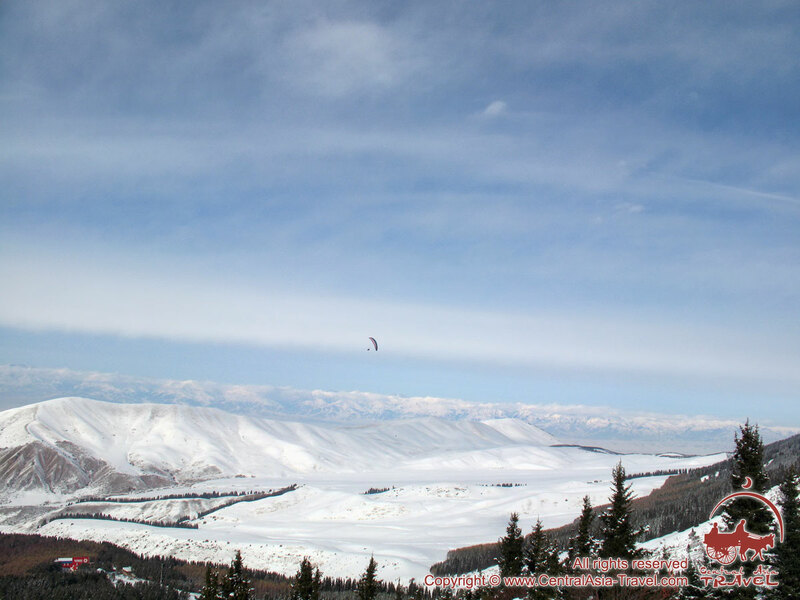 ‘Too Ashuu’ is a ski base (mountain base, ski resort) located on the southern slope of the Too-Ashuu Pass, 2 hours by car from Bishkek along the road Bishkek-Osh, at an altitude of 3,000 m above sea level. 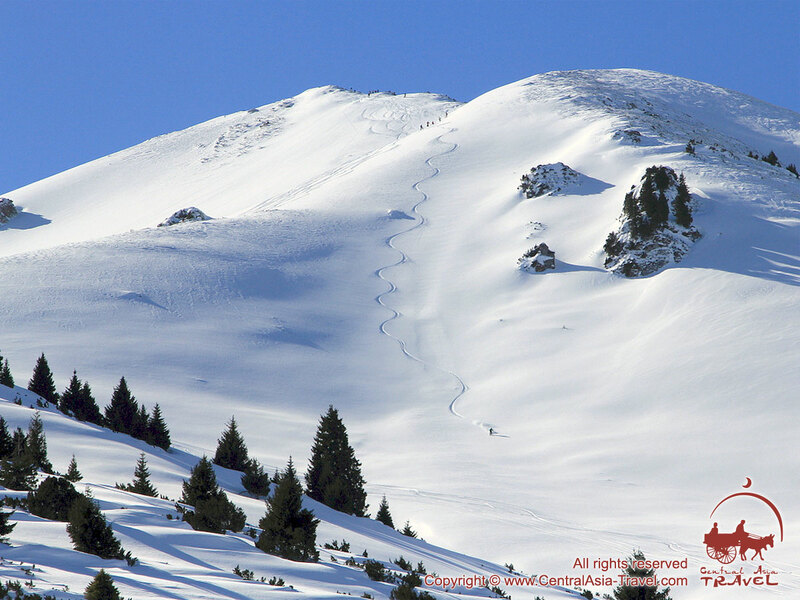 ‘Too Ashuu’ is the highest ski resort in Kyrgyzstan, which is why the skiing season begins there early and ends late. The ski resort ‘Too Ashuu’ is a modern complex with high-quality ski trails (ski runs, pistes) suitable both for novices and for experienced skiers, extensive broad slopes specially prepared for downhill skiing and snowboarding and wild slopes for those fond of freeriding (backcountry, side country,off-piste skiing & snowboarding). 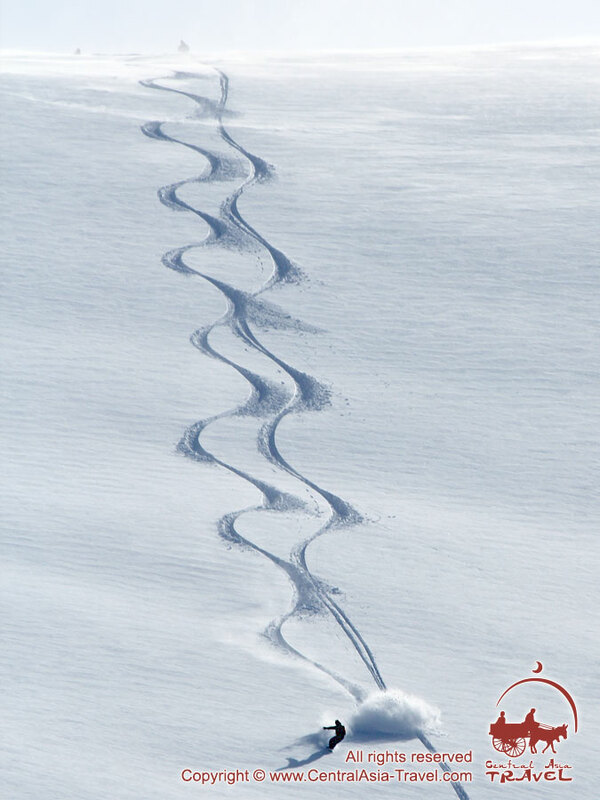 The trails of the ski resort ‘Too-Ashuu’ are the longest and most numerous in Kyrgyzstan, their lengths varying from 1,500 m to 5,000 m.
‘Too-Ashuu’ has a total of 3 ski trails varying in length and complexity. 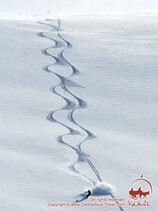 All the ski trails are prepared using Prinoth snow groomers. 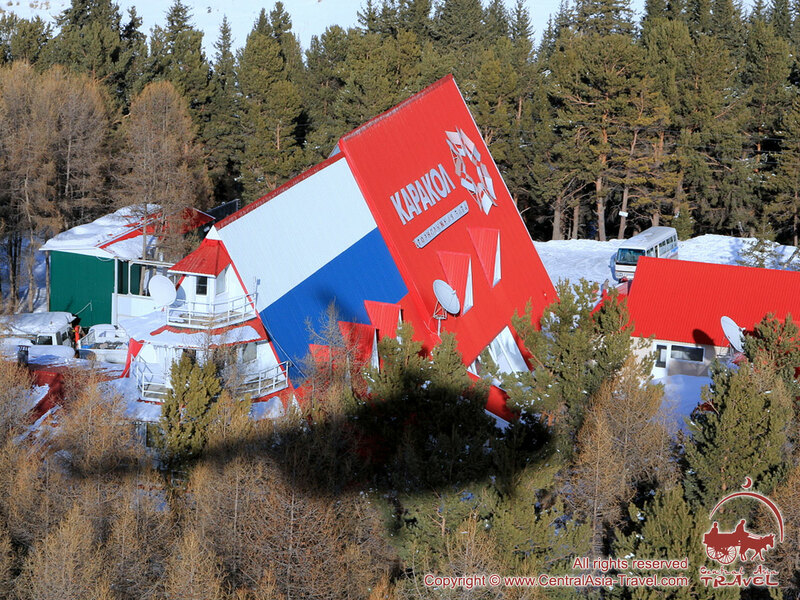 The ski base ‘Too-Ashuu’ features a two-chair lift for 120 persons, 1,500 m long. The chairlift’s average speed is 4 m/sec. Riding is available at any altitude. The highest point where skiing or snowboarding is possible is 3,000 m. The point provides a marvellous view of the Suusamyr valley. 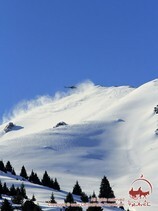 The place is characterised by perfect climatic conditions, the slopes being covered with natural snow 6 months a year. • Cold, dry winter powder (‘Tien Shan’ powder) with depth up to 2,5 m.
• Average temperatures during the skiing season: -9.3° С. • Altitude differencials: from 450 m to 750 m.
• Long Season: Skiing through 6 months - October to April (the longest season in Kyrgyzstan). 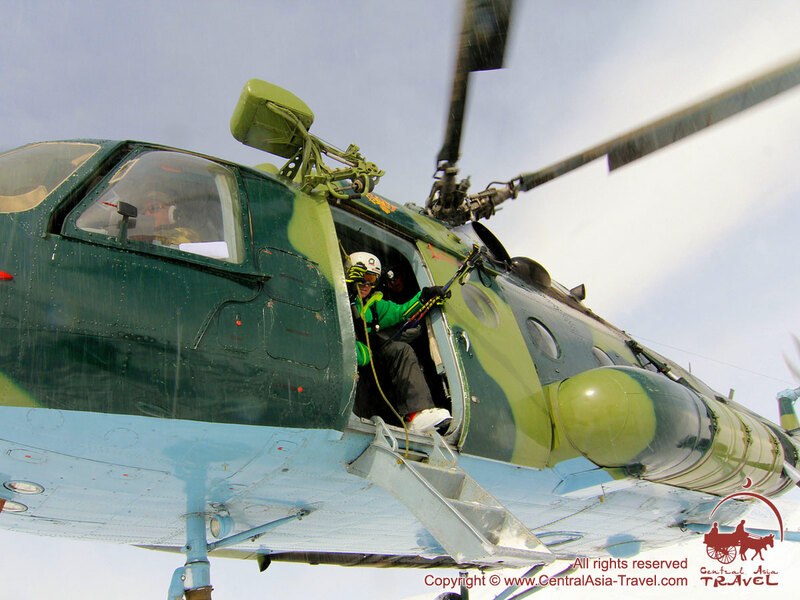 • Heliskiing in the Suusamyr valley begins in mid-January and lasts till late April. The territory of the ski resort ‘Too-Ashuu’ includes a number of warm and comfortable wooden cottages consisting of cozy rooms for two, four and six persons, accommodating a total of 66 persons. All the rooms have all necessary furniture. Room for 2, 4, 6 persons in cottages Single room with heating system, toilet, shower, hot and cold water. Breakfast included. • A café bar where you can enjoy the dishes of the local and European kitchens and taste various Caucasian shashlik (shashlyk) shish kebabs. The visitors can make an individual order and pay in conformity with the café’s price list or opt for a table d'hôte, in accordance with their culinary preferences. • Skiing equipment rental. The office always has a wide range of downhill skis (for children, adolescents and adults) and snowboards, while the office’s assistants will always help you select an outfit that would suit you best. • An autonomous power station with a capacity of 2 Megawatt. - Tuition facilities are on offer. 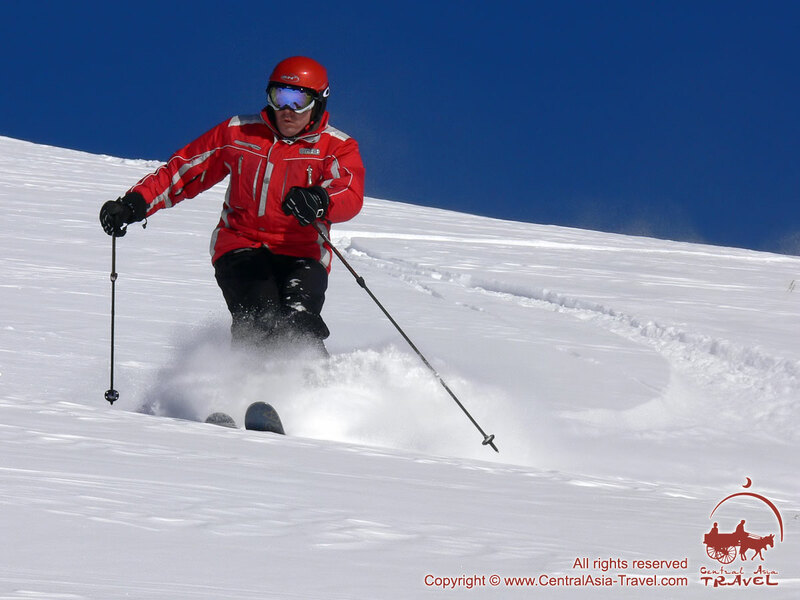 Services from a qualified ski instructor, who can help select an outfit and, if necessary, teach skiing. - Driving a snowmobile (with an instructor, if needed). - A ticket for use of the chair lift and ski trails (during a day/half a day). - Tickets for one-time use of the chair lift and ski trails. - Operation during a whole year. - In warm seasons the resort offers a series of summer entertainments: koumiss (also spelled kumiss, kumis) therapy, horse tours, paragliding, walking treks, organization of summer camping.